I was originally introduced to acorn squash by my Mother in Law. She put it in the oven with a little butter and brown sugar. Having been raised by a Mom that was not a fan of squashes it was a very new flavor to me and I fell in love with the first bite. On the other hand my husband grew up with it and doesn’t find it as exciting. With this dish I decided to dress up my Mother in Laws recipe a little but not loose the sweet flavor. I thought a Biryani style rice would go well and created my own spin to this Indian rice dish. The Fried onion pieces were added to the top because my six year old will try anything that they are on top of, though I definitely think the dish would be fine without this addition. Preheat oven to 350 degrees. Cut acorn squashes in half and clean out seeds. Place squashes in casserole dish cut side down and fill dish 1/3 of the way with water. Put in preheated oven for 30 minutes. In a pan melt butter and add shallot. Saute until it has become translucent. Add ingredients from persimmon to Braggs. Cook over medium heat until water has reduced to half. Mix cooked rice, persimmon mixture, garbanzo beans,bell peppers, peas, raisins and spinach. After squash has cooked for 30 minutes take out of oven, remove excess water from casserole dish, turn squashes cut side up and stuff with rice mixture. Sprinkle fried onion or bread crumbs over top of rice if desired. Bake for 30 more minutes and serve. 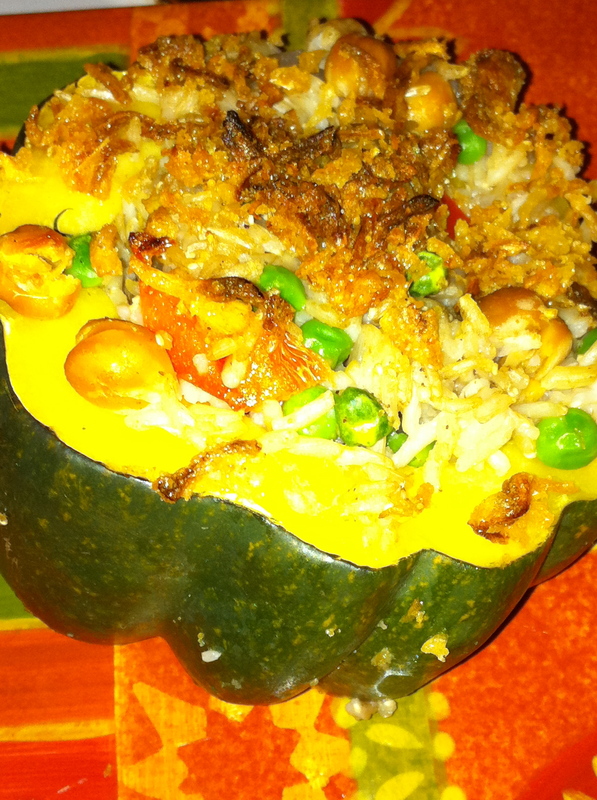 Gallery | This entry was posted in Gluten Free, Main Course, Sides and tagged acorn squash, dairy-free, gluten-free, persimmon, rice, vegan. Bookmark the permalink.